Another field from the previous case of mediastinal mature cystic teratoma. 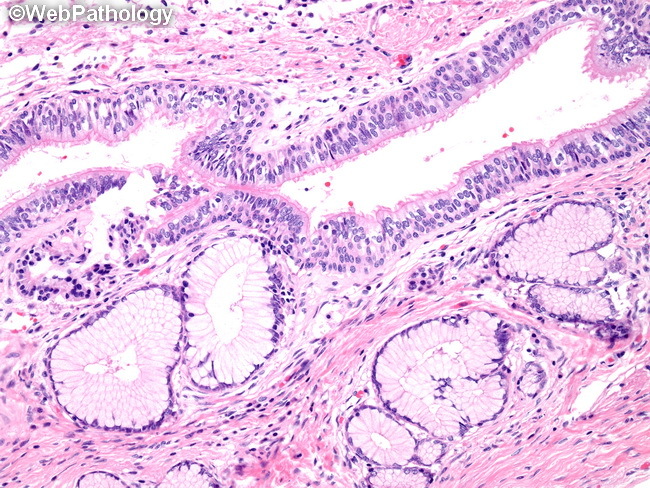 Respiratory epithelium is seen in the upper half with mucinous intestinal type epithelium below it. Pancreatic tissue is also commonly seen (not shown here) which may cause hypoglycemia (due to insulin secretion). Pancreatic enzyme secretion may cause dense fibrosis and adhesions. The overall prognosis of mature cystic teratoma of the mediastinum is excellent.